Banh Xeo is a good suggestion. Like my grandmother always makes Banh Xeo whenever the raining season begins, it is a good way to welcome the coming season. Basically, Banh Xeo is Vietnamese savoury fried pancakes with a half-moon shape made of rice flour, water, turmeric powder, stuffed with slivers of fatty pork, shrimp, diced green onion, and bean sprouts. To serve, the cake will be wrapped in mustard leaf, lettuce leaves or banh trang wrappers, and stuffed with mint leaves, basil, fish leaf and/or other herbs, and dipped in a special sauce which consists of fermented soy bean and sticky rice sauce, ground pork liver, ground and toasted peanut and seasonings. The sauce is a signature that only Central region – Danang serves, for other part of the country, it is only a sweet and sour diluted fish sauce. The best feeling when having Banh Xeo is sitting near by the fire, listening to the loud sizzling sound when the rice batter is poured into the hot skillet. Wrap the warm cake with fresh vegetable and herbs. Dip it into the warm and nutty sauce. Have a mouthful bite and enjoy the delicious food while listening to the rain outside. Whenever mention about Banh Xeo, it is hard to not to talk about Nem Lui and Bun Thit Nuong. 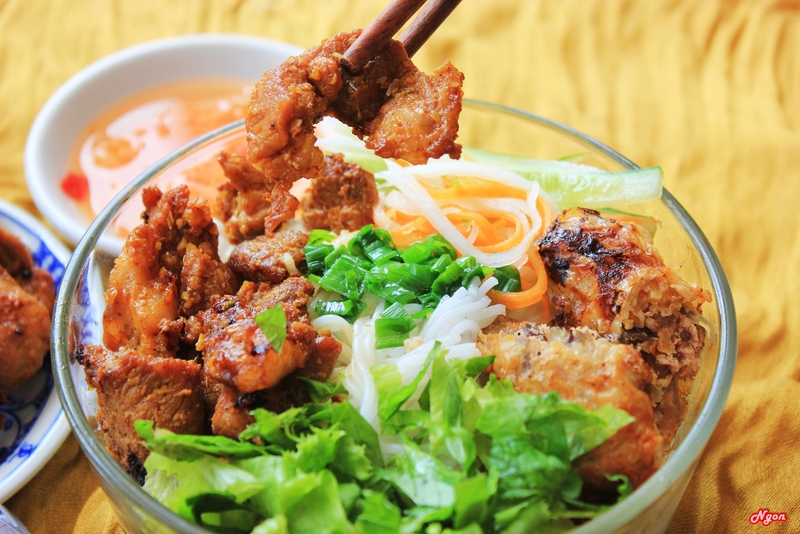 Nem Lui and Bun Thit Nuong can be served all season but it is best to enjoy with Banh Xeo. After some wrapped with mostly vegetable, Nem Lui will provide protein while Bun Thit Nuong will help fill up the rest of your belly. Nem Lui is a kind of sausage. Pork is marinated then wrapped around a chopstick with a size of two fingers. After that, grill it slowly above charcoal fire until it turns gold, then, it is ready to serve. Nem Lui can be eat with the same way as Banh Xeo or just simply dip it into the sauce and enjoy. Bun Thit Nuong or so called Rice noodle with grilled meat. Vietnamese cold rice vermicelli noodle dish is topped with grilled pork, fresh herbs like basil and mint, fresh salad and bean sprouts. In Danang, The dish is dressed in special sauce. The same kind of sauce that use for Banh Xeo and Nem Lui but much dense than that. Also, the dish is topped with roasted peanuts, Vietnamese pickled carrots. Just siply mix all the ingredients together and enjoy. It is normal to have all three dishes together in one meal so that people can have more energy in a winter day. Especially after 5 PM (after working hour), you can see people rushing out of the offices or schools, go straight to a nearby restaurant to avoid the heavy rain and enjoy the warm, hearty dishes..